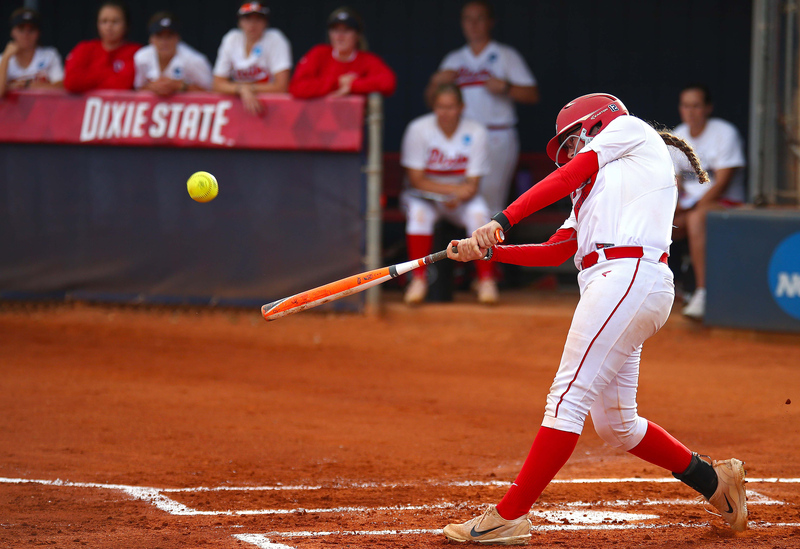 ST. GEORGE – The Dixie State softball team split with the visiting Cougars of Azusa Pacific on Friday night. The two teams are both in the hunt for the conference championship. Only two games separate the top four teams, which also includes Cal Baptist and Concordia. Preseason and reigning PacWest Conference Player of the Year Nicki Sprague had four RBIs, going 3 for 3 at the plate, to lead Azusa to an early 6-1 lead through three-and-half innings. In the bottom of the fourth, Josey Hartman doubled in two runs to pull DSU to within 6-3. But the Trailblazers would not score again as Cougar pitching would retire nine of the next 11 batters to end the game. Beardshear (12-3) took the loss. She pitched the complete game. She gave up 14 hits and struck out two. Paulson was the only Blazer to have multiple hits. In the second game, the Cougars again scored first. But every time APU put runs up, the Trailblazers would respond with equal or more runs in the bottom of the inning. After two scoreless innings, Azusa scored two in the third. Dixie State had stranded the bases loaded in the first inning but did not waste the opportunity in the third inning. Janessa Bassett drew a walk and then advanced to second on a foul out. Mallory Paulson then reached on a throwing error. Jessica Gonzalez then singled to load the bases. Kenzie Sawyer’s single to left field scored Bassett. Dani Bartholf then hit a double to clear the bases. Shelby Yung then batted in Bartholf on a fielder’s choice before APU got out of the inning. Dixie State led 5-2. Azusa tied the score in the next inning with two of the runs being batted in by Sprague. But Dixie State continued its offensive barrage as well. Hartman started the inning by reaching on a fielding error. Bassett then singled with a bunt. Both runners advanced on a wild pitch. Paulson then walked to load the bases. Gonzalez hit a double to score two runs. Sawyer then hit a sacrifice fly to score Paulson. The lead had climbed to 8-5. After a scoreless fifth, the Cougars knotted the score again in the top of the sixth with three runs. Again, Sprague batted in two of them and later scored the third. Bailey Gaffin started the sixth inning by reaching on a throwing error. Paulson then laid down a sacrifice bunt to move Gaffin to second. Gaffin then moved to third on a wild pitch. Gonzalez then drew a walk. Sawyer singled to right field to score Gaffin. Bartholf then hit the ball sharply to short. The grounder was bobbled, but the throw to third was still in time to get Gonzalez. Yung then singled to center field, scoring Taylor Godfrey, who had entered the game as a pinch runner for Sawyer. With Arista Honey at the plate, Bartholf scored on a wild pitch on a close play at the plate. Honey, who had the same angle as the umpire saw the play. Honey singled up the middle to score Yung. After a pitching change, the Cougars finally got out of the inning, but faced a 12-8 deficit. In the top of the seventh, Yung made a sliding catch in foul territory to get the first out. APU did get two of their next three batters aboard with fielding errors. Sprague came to the plate with two on and two out. Pitcher Alex Melendez got her to ground out to second base to end the game. Melendez (8-4) got the win in relief of Alexis Barkwell. Offensively, Gonzalez and Sawyer both had multiple hits. Sawyer and Bartholf led the team with three RBIs apiece. With the split, DSU moves to 28-8 overall and 13-5 in the PacWest. Azusa Pacific is now 20-9 overall and 12-4 in the PacWest. The two teams will renew the series Saturday with game one of a doubleheader beginning at noon.